Hedge the Euro? Not So Fast! While CLS still thinks Europe looks attractive, what about the euro? Clearly by increasing our European exposure, we are increasing our exposure to the euro as well. Despite the fact that the dollar has been on a tear lately, the euro has fallen considerably since hitting a high in May. This really shouldn’t be a huge surprise, considering the European Central Bank’s stance on expanding its balance sheet by purchasing asset-backed securities and covered bonds in order to boost the struggling European economies. What does the recent euro weakness mean for portfolios that are exposed to European equities right now? It’s hard to tell in the short-term – exchange rates can be volatile, news-driven, and changes in projected growth are all factors which typically drive the direction of currencies in the short-term. If one takes a step back, however, in reviewing purchasing power parity, the dollar appears overvalued relative to other currencies. 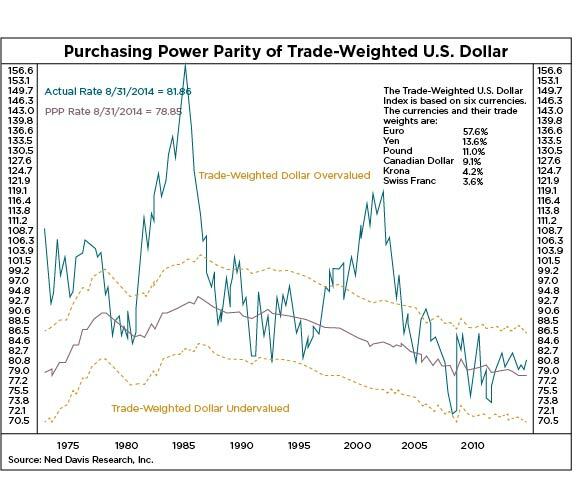 The chart below shows the purchasing power parity of the U.S. dollar versus major trading partners. As you can see, according to purchasing power parity, the dollar is approximately 3.8% overvalued relative to these other major currencies. This would imply that hedging euro exposure may not be quite as beneficial as some might think. CLS will continue to monitor the currency situation very closely, given our international stance, and the effects that these currencies will have on our portfolios.